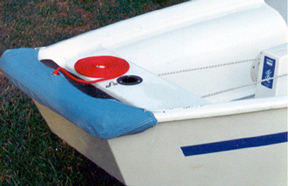 Pram Bow Bumper -- One Design Sailboat Covers -- The Sailors Tailor, Inc.
Opti Bow Bumper is a unique product originally designed and made by us. Others have copied our design. Tough Polyester Army Duck over closed cell foam runs from starboard side across bow and around to port side. Pads and protects the corners. Requires a small hole on either side rail to lace bumper and padding securely to boat. Grommet in center allows painter to pass through bow bumper.